Grace Wright married Dr. Thomas Meriton esq. of Castle Levington. Thomas was the son of Rev. George Meriton, Dean of York 1617, Chaplain to Queen Ann; and Mary Rands, daughter of Thomas Rands and Mary Yorks, and granddaughter of Bishop Henry (alias "Holbeach") Rands (Rande) dean of Worcester. Thomas Meriton was a medical physician, practicing between the years 1618-1638. He received his BA in 1609, his MA in 1613, and his MD in 1627. Castle Leavington, his birthplace, was built by George Meriton, Dean of York who died in 1624. The “Castle” eventually passed to the Pennyman family, and was sold in 1802 by Sir James Pennyman. Dr. Thomas Meriton was the brother of ANNE MERITON who married Rev. 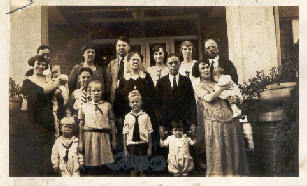 Francis Wright III (whose family are listed below). 1) GEORGE MERITON or MERRITON (1634-1711) legal and miscellaneous writer, born in July 1634, was the eldest son of Thomas Meriton (1606-1651) by his wife Grace, daughter of Francis Wright of Bolton-upon-Swale, Yorkshire. He inherited the paternal estate at Castle Leavington, Yorkshire, in 1652, studied law, and became an attorney or "pratiser of the common law" at Northallerton in Yorkshire. On the title page of "Abridgment of the Irish Statues" he is described as barrister-at-law, but his name cannot be found in the books of the Inns of Court of London or Dublin. After 1684 he left England and went to Ireland, and in the autumn of 1700 had the degree of LL.B. conferred upon him by the University of Dublin. He died in Dublin in 1711. By his wife Mary, daughter of John Palliser of Kirkby Wiske in Yorkshire, he had five sons and one daughter. His eldest son, Thomas, born in October 1657, was admitted a student of Gray's Inn, London, on 17 June 1675. George, the second son, born in 1660, who entered St. John's College, Cambridge, 13 June 1678, died in Cambridge on 14 Aug 1680 and was buried in All Saint's Church. John, the third son, born at Kirkby Wiske, was educated at Northallerton and Christ's College, Cambridge (admitted 30 June 16682) and graduated B.A. in 1685. Luke, his father's executor, Charles and Katherine were mentioned in Meriton's will, made 26 Sept. 1701, and proved 15 march 1711. His wife survived him. Meriton was 'the truly noble, judicious gentleman, and most… esteemed brother…' to whom Thomas Meriton the dramatist dedicated his tragedy "Love and War" in 1658. Although the writer of several books on law, his most noticeable work is a curious humorous poem, "The Praise of Yorkshire Ale," the scene of which is laid in Northallerton. To this is added "A Yorkshire Dialogue in its Pure Natural Dialect," and "An Alphabetical Clavis, unfolding the meaning of Yorkshire Words made use of in the aforegoing Dialogue." The work, which is of no small merit, was published under the initials "G.M., gent," in London 1683, York 1683, London 1684, York 1695 and 1697. Newsam in his "Poets of Yorkshire" ascribed it to Giles Morrington, an error repeated in Ingledew's "History of Northallerton," pg 387, where the greater part of the poem is given. In Boyne's "Yorkshire Library" it is ascribed to George Merrington. This article about George Meriton goes on to list a dozen or more of his published works. In Ireland he was "said to be made a judge." Your Highness never tasted to this day. George married Mary PALLISER -of Kirkby Wiske in Yorkshire, daughter of John PALLISER . A) Thomas MERITON was born Oct 1657. B) George MERITON (died young-while at Cambridge) was born 1660. He died 14 Aug 1680 in Cambridge and was buried in All Saint's Church. C) John MERITON was born in Kirkby Wiske. 2) THOMAS MERITON (fl 1658) dramatist, born in 1638, was the second son of Thomas Meriton of Castle Leavington, Yorkshire, and Grace, daughter of Francis Wright of Bolton-on-Swale, and so grandson of George Meriton, dean of York, and younger brother of George Meriton, author of the "Praise of Yorkshire Ale." He was educated at a private school at Danby Wiske, and admitted at the unusual age of four-and-twenty a sizar of St. John's College, Cambridge, 9 May 1662, B.A. 1665, M.A. 1669. He published two tragedies in 1658, "Love and War," dedicated to his brother, George Meriton, and "The Wandring' Lover," which, according to the title page, had been 'acted several times privately at sundry places by the Author and his friends, with great applause.' In the dedicated to Francis Wright he mentions the fact that he had also written the "several Affairs," a comedy, and the "Chast[e] Virgin," a romance, but that they were only shown to some private friends. "Happy certainly," says Langaine, "were those men who were not reckoned in the number of his friends." Langbaine describes him as "certainly the meanest Dramatick writer that ever England produced." Of George Wright, the eldest surviving son, we have the following information: George Wright, esq. of Bolton-on-Swale, born in 1629, who m. first, Beatrice, daughter of James Mauleverer, (he was great-great-grandson of Sir William Mauleverer, Knt. of Arncliffe, by Jane, daughter of Sir John Conyers, of Sockburne, in Durham. This ancient family, which but recently became extinct, was descended, in a direct male line, from Sir Richard Muleteer, knight, who came into England with William the Conquerer, by whom he was appointed master of the forests, chases, and parks north of Trent.) esq. of Arncliffe, in Yorkshire, by Beatrice, daughter of Sir Timothy Hutton, of Marske, (by his wife, Elizabeth, daughter of Sir George Bowes, of Streatlam, in the county palatine of Durham, the knight marshall, who suppressed the great northern rebellion, headed by the potent earls of Westmoreland and Northumberland, temp. Queen Elizabeth,) and had issue. 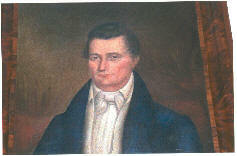 John Wright , esq. of Bolton-on-Swale, proprietor of estates at Bolton-on-Swale, Greenbury, Ellerton, Scorton, and in the parish of Catterick, in the county of York, and of property at Newcastle-on-Tyne. I know very little about the other children of Rev. Francis Wright and Anne Meriton, except about our direct ancestor, Capt. Richard Wright, a younger son. Capt. Richard Wright, son of Francis Wright & Anne Meriton, was born about 1633 in Bolton-on-Swale, Yorkshire, England - died 1 Dec 1663 in Northumberland County, VA. Our immigrant ancestor. “Mr. RICHARD WRIGHT was born, according to his deposition made on August 20, 1655, in England in the year 1633. He died in Virginia at the age of thirty. Of his eight or nine years of independence, nearly all were passed in Virginia. Such American records of him as remain convey the impression of his having been a typical Londoner of his time - eager for adventure, self-reliant, and imbued with the amazing self-confidence characteristic of young Englishmen. Executive ability is t5he trait chiefly suggested by these Virginia records. As he designated himself "of London," it is an unavoidable inference that the "Pool of London" with its fleet of ships bound to Virginia was a sight common to his eyes. He was not lacking in commercial training, and he certainly became proficient in navigation. Tobacco was the magnet that drew him overseas. He exemplified the fact that "of all the European people in those times, the English possessed in the most marked degree the bold and intrepid spirit which would move them to leave their native soil behind, and cross many thousand miles of sea, and also the patient and calculating spirit which would enable them, when once fixed in their settlement, to make the most of the advantages." Richard died at the age of 30. Very sad, that he died so young, and to think of what he might have accomplished had he lived longer. Richard Wright married Anne Mottrom, daughter of Col. John Mottrom. Anne was born about 1639 in England, died 1707 in Westmoreland County, VA. Anne would marry twice more after Richard’s death. 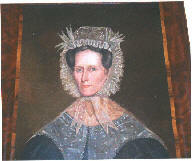 Anne Mottrom Wright (dau of Col. John Mottrom) married 2nd) David Fox. 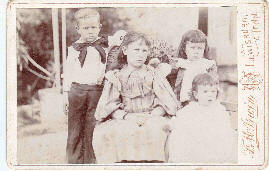 Two children were named in David Fox’s will: William and Elizabeth Fox. Anne married 3rd) St. Leger Codd. 2 children: James & Berkeley Codd. James Codd inherited lands in England; and Berkeley was of Sussex County, Delaware. Capt Richard Wright died young and named his children's maternal uncle, Col. Nicholas Spencer to see to the education of his children. Mottrom Wright was born about 1658 - he died 10 Oct 1700 in England. Mottrom Wright was only a child at the death of his father, Richard Wright in 1663. He was given lands on Elk River and Sasafras River in Maryland according to the terms of his father's will. He married before March 12, 1684, Ruth Griggs, daughter of Robert Griggs of Lancaster County, VA, but their marriage was not to be happy one. They resided in Sittenburn Parish, an area now included in Richmond County, VA.. Mottrom Wright sold his plantation in Sittenburn Parish on May 5, 1691. This sale may herald the break up of their marriage. He settled his affairs, took two of the children, Mottrom II and Frances, as his own, leaving the other two to their mother, and leaving Mottrom II and Frances with a friend, Frances Moor, went to England, and died there, in 1700. Excepting a few shillings to the other children, he willed his entire estate to Mottrom II and Frances, stipulating that in the event of their death it should go to his brother Francis' son JOHN WRIGHT. "Mottrom Wright, Senior, died in England, the children unnamed in the will remained in Virginia more or less subject to the influence of their mother. It is obvious that the parents had divided between themselves the four children, the father taking Frances and Mottrom, Jr. In order that none of the other children should ever inherit his estate, he made his brother Francis Wright's son, John, the sole heir in case the daughter Frances and eldest son, Mottrom died without issue. The indications are that the four children were two sons and two daughters; the father chose the two eldest to be his heirs. THE WILL of Mottrom Wright of Mile End in the parish of St. Dunstan's Stepney alias Stebunheath, County Middlesex, merchant, dated 8 October 1700: I give to my daughter Frances Wright £100 and 700 acres of land and plantation on the north side of Rappahanmack Creeke in Virginia, to be taken out of my lands, not hurting my manor plantation there. To my son Mottrom Wright, £600 and all my lands, houses, etc, in Virginia or elsewhere, excepting the above said 700 acres; and the last six negroes I bought. To my cousin John Wright of Potomac River in Virginia, £50. To each and every other of my children by my wife Ruth Wright, 20s. and no more. To the said Mottrom and Frances Wright, all the residue of my temporal estate whatsoever, equally between them, at their several ages of 21 or marriage, each being the other's heir. If they both die, I bequeath their inheritance to my said cousin (* 'cousin' meaning 'nephew') John Wright, I request my friend Captain John Purvis to be overseer of this my will, and to se my said son brought up and educated according to the church of England; and I appoint my said son Mottrom my sole executor. (signed) Mottrom Wright. Witnesses: J. Sharpe, A.M., James South, Hannah Bradley, Thomas Quilber, notary public.